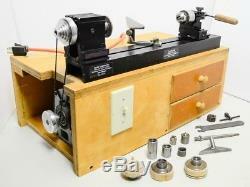 Bonnie KLEIN Small Mini Wood Turning Lathe Woodturning Woodworking Miniature There are 64 photos of the item below. -- Vintage used Bonnie Klein mini lathe. Everything shown in the photos is all that is included, no other parts or accessories are included. Lathe runs smoothly and true. Total bed length is 21.25. Length between turning face and tip of chuck (with feed lever pulled back), is 11-1/8 (with chuck jaws retracted). -- I show the details of the motor in the photos of the motor label below. This is mounted on a 13" x 24" x 8.5" work chest made from 3/4" ply holding the motor and two drawers. -- I show close-ups of all of the accessories and the lathe itself so study the photos to see what is included. There are 3 turning faces with wood glued to the face (See photos), I mention this to note the wood is glued into place. I pack so an item can be dropped onto concrete with no worries of damage (I custom design packing from scratch for large heavy items). Will be packed so if dropped upside down with the lathe being on the bottom, the weight of the chest will not in turn damage the lathe. I'm allowing for 4 packing space on each side/top/bottom. -- See photos for condition details. -- I don't have a way to arrange for a local pick-up of this item, I'm sorry for the inconvienence <. The item "Bonnie KLEIN Small Mini Wood Turning Lathe Woodturning Woodworking Miniature" is in sale since Wednesday, August 15, 2018. This item is in the category "Home & Garden\Tools & Workshop Equipment\Power Tools\Lathes & Accessories". The seller is "ahp-washington" and is located in Everett, Washington. This item can be shipped to United States, Canada, United Kingdom, Denmark, Romania, Slovakia, Bulgaria, Czech republic, Finland, Hungary, Latvia, Lithuania, Malta, Estonia, Australia, Greece, Portugal, Cyprus, Slovenia, Japan, China, Sweden, South Korea, Indonesia, Taiwan, Thailand, Belgium, France, Hong Kong, Ireland, Netherlands, Poland, Spain, Italy, Germany, Austria, Israel, Mexico, New Zealand, Philippines, Singapore, Switzerland, Norway, Saudi arabia, Ukraine, United arab emirates, Qatar, Kuwait, Bahrain, Croatia, Malaysia, Bahamas.